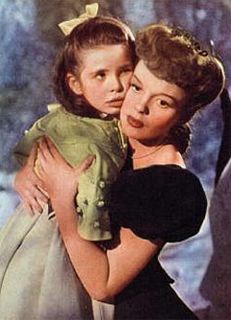 This still from Meet Me in St. Louis comes from the moments after "Have Yourself a Merry Little Christmas." Margaret O'Brien has just taken a shovel and gone after the snow family on the front lawn. This still has lousy color, for which I apologize. Judy's dress in the scene is red, and a gorgeous red at that.